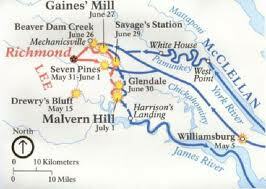 As June 3oth dawned the Union army was in full retreat to the James. By noon, one-third of the Army of the Potomac had reached the James, while the other two-thirds was strung out on roads leading to the James between Glendale and White Oak Swamp. This presented a tempting target to General Lee. Ordering Jackson in the north to cross White Oak Creek and press the Union rear guard, the remainder of the Army of Northern Virginia, some 45,000 men, would attack two miles southwest at Glendale, and inflict what Lee hoped would be a crushing defeat on the Union forces marching to the James. It was a good plan that fell down almost completely in execution. Jackson, with that strange lethargy that marred all his operations in the Seven Days, spent all of the day north of White Oak Creek, launching feeble assaults which were easily repulsed by the Union VI Corp under General William Franklin. The Confederate attack at Glendale fared little better. Huger’s division failed to participate in the offensive, slowed by felled trees and the failure of Huger to take an alternative route. Holmes and Magruder launched a weak attack against the V Corps of General Fitz John Porter, the attack being broken up by Union artillery fire, supplemented by naval bombardment. On June 29, 1862, the bulk of the Army of the Potomac had gathered at Savage’s Station, a supply depot on the James River, preparing to pass over the White Oak Swamp. Lee had again devised a complex plan of attack that his green army would have difficulty carrying out. AP Hill’s and Longstreet’s division were ordered east towards Richmond and then southeast to take the Glendale crossroads, eliminating the possibility that they could participate in the attack on Savage’s Station. Holmes’ division was sent even farther south towards Malvern Hill. 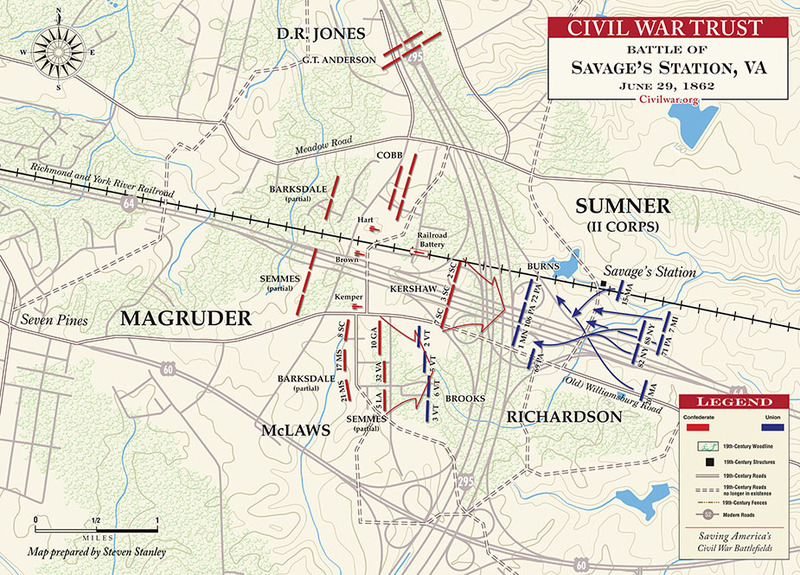 Left for an attack on Savage’s Station was Magruder’s division to attack from the west and Jackson’s three divisions north of the Chickahominy above Savage’s Station. Magruder attacked at 9:00 AM in a skirmish. His main attack was not launched until 5:00 PM, Magruder realizing he was heavily outnumbered, 14,000 to 26,000. Jackson did not attack, spending his time repairing bridges over the Chickahominy, and confused by a badly garbled order from Lee that caused him to think that he was ordered to stay north of the Chickahominy. The battle was a bloody stalemate, with about 1500 casualties. The Union army continued to retreat abandoning 2500 wounded in Savage’s Station. Jackson got across the Chickahominy at 2;30 AM on June 30, far to late to participate in the battle or prevent the retreat of the Union army. It is hard to believe that the Jackson who performed so ineptly in the Seven Days was the same man who had performed so brilliantly in the Valley just a few weeks before. Continuing on with our look at the Confederate offensive of the Seven Days, we come to the battle of Gaines Mill. After the battle of Mechanicsville, Lee assembled a Confederate attack force of six divisions, 57,000 men, for the largest Confederate attack of the War, aimed at Porter’s V Corps, McClellan neither sending sufficient units from south of the Chickahominy to reinforce Porter, nor attacking against the weak Confederate forces holding Richmond, McClellan paralyzed by his belief that he was massively outnumbered both north and south of the Chickahominy. McClellan’s order for Porter to withdraw came just before dawn on the 27th. Numerous men in Brigadier General McCall’s division were captured by the Confederates due to the precipitate retreat necessary to comply with the order. Porter picked out a good defensive position on a plateau behind Boatswain’s Swamp to make his stand. He placed two divisions on the line and two divisions in reserve. The battle began at 1:00 PM with a series of unsuccessful frontal assaults. 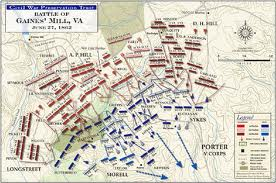 Jackson on the Confederate left was late again and not in position to attack until the general assault of 7:00 PM. By this time the outnumbered Union troops were weary and the Union line crumpled up, Porter withdrawing in good order to the bridges over the Chickahominy, his corps crossing to the south side at 4:00 AM on June 28. The battle was a clear-cut Confederate victory, although their casualties of 7,933 were slightly greater than the Union casualties of 6, 833. The victory could have been greater if Jackson had been in position by 1:00 PM. A retreat by Porter with eight hours of daylight could easily have ended in the destruction of Porter’s Corps. 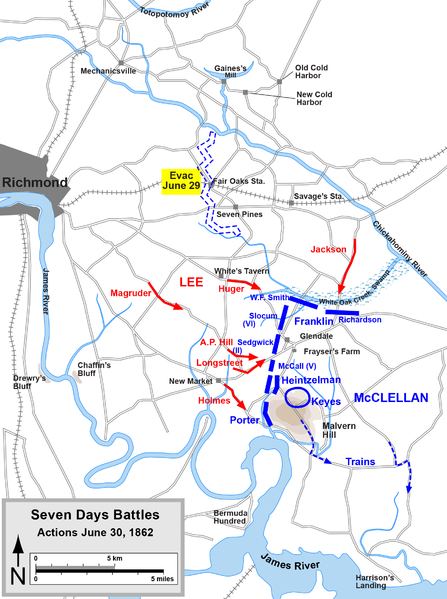 As it was, McClellan was completely unnerved by the Confederate victory, and ordered a full retreat of his entire army from Richmond, which Lee and his army had saved. 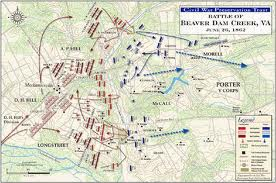 The Battle of Mechanicsville, also known as the battle of Beaver Dam Creek. 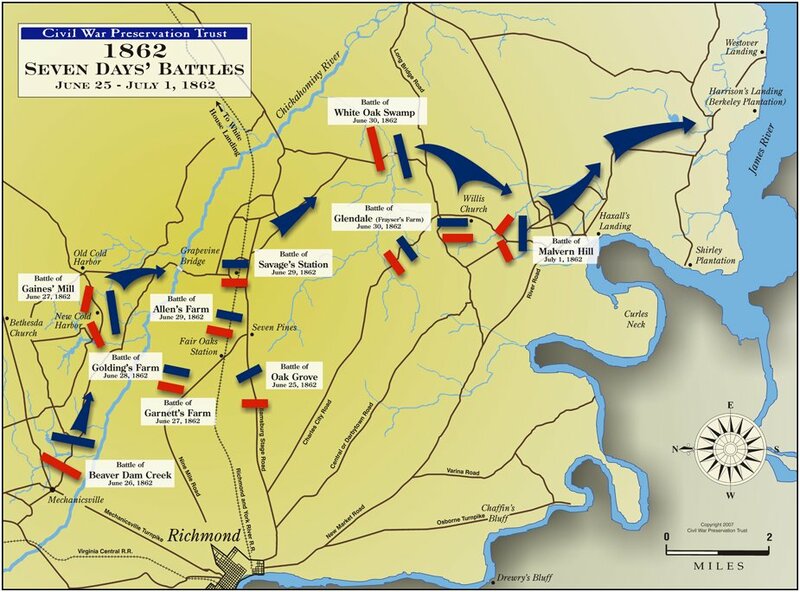 which opened the Confederate offensive of the Seven Days on June 26, 1862 was a tactical fiasco and defeat for the Army of Northern Virginia and a strategic defeat for the Army of the Potomac. Lee’s plan to attack Porter’s V Corps, the only corps of the Army of the Potomac north of the Chickahominy, defeat it and turn the right flank of the Army of the Potomac went badly awry in execution. Beginning the poor performance that would plague him throughout the Seven Days, Jackson was four hours late in attacking the north flank of Porter’s corps. Instead, AP Hill attacked with his division in futile and bloody frontal assaults which were easily repulsed by Porter. After Jackson’s arrival, he bivouacked his men, although the sounds of a major attack were clear. AP Hill renewed his attacks, reinforced by DH. Hill’s brigade, although Lee had ordered no more attacks and was again bloodily repulsed. Confederate casualties were 1461 with Union casualties half this number. So a humiliating tactical defeat for the Confederates marked by an inept inability on the part of Lee to put forward a coordinated attack. One of the more important series of battles in American history, collectively known as the Seven Days, occurred in Virginia 150 years ago this week. By driving away McClellan’s larger Army of the Potomac from Richmond, Robert E. Lee ensured that the Civil War was not going to be a quick Union victory, and that the Civil War, instead of a minor blip in US history, would, by the beginning of 1863, be transformed into a revolutionary struggle that would destroy slavery and alter the Union forever. Before taking command of the Army of Northern Virginia after the wounding of General Joe Johnston at the battle of Seven Pines, Robert E. Lee, had acquired the nickname of “Granny Lee” due to his construction of fortifications and a perception that he was too cautious and lacked an aggressive spirit. Few nicknames in history have been more inapposite. As a commander Lee was a gambler and far preferred to attack the enemy than to passively await an attack. After taking over command from Johnston at the beginning of June, Lee began working towards a big offensive to drive the larger Union army away from Richmond. To accomplish this he began to draw reinforcements to Richmond from throughout Virginia, most notably Jackson’s Valley Army. From June 12-15th he had the cavalry of his army, brilliantly commanded by Jeb Stuart, ride around McClellan’s army to ascertain what portion of McClellan’s army was north of the Chickahominy River. The fourteen days from June 21—the vigil of the Feasts of St. John Fisher and St. Thomas More—to July 4, Independence Day, are dedicated to this “fortnight for freedom”—a great hymn of prayer for our country. Our liturgical calendar celebrates a series of great martyrs who remained faithful in the face of persecution by political power—St. John Fisher and St. Thomas More, St. John the Baptist, SS. Peter and Paul, and the First Martyrs of the Church of Rome. Culminating on Independence Day, this special period of prayer, study, catechesis, and public action would emphasize both our Christian and American heritage of liberty. Dioceses and parishes around the country could choose a date in that period for special events that would constitute a great national campaign of teaching and witness for religious liberty. 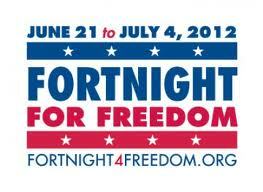 We here at The American Catholic will be participating in the Fortnight For Freedom with special blog posts on each day. This is the fourth of these blog posts. From the beginning of our Republic, American Catholics were at the forefront of the battle to free America from British rule and to enshrine a committment to liberty in our founding documents. The remarkable Carroll family of Maryland was at the head of this effort by American Catholics. Charles Carroll of Carrollton signed the Declaration of Independence. His cousin Daniel Carroll signed both the Articles of Confederation and the Constitution. Daniel Carroll’s younger brother John Carroll, was the first bishop in the United States of America. Something for the weekend. A Confederate paean to The Infantry sung by Bobby Horton, who has waged a one man crusade to bring Civil War music to modern audiences. After the Civil War, a veteran of the conflict, I can’t recall his name, said that with Confederate infantry and Union artillery there was no position on Earth that he could not take.